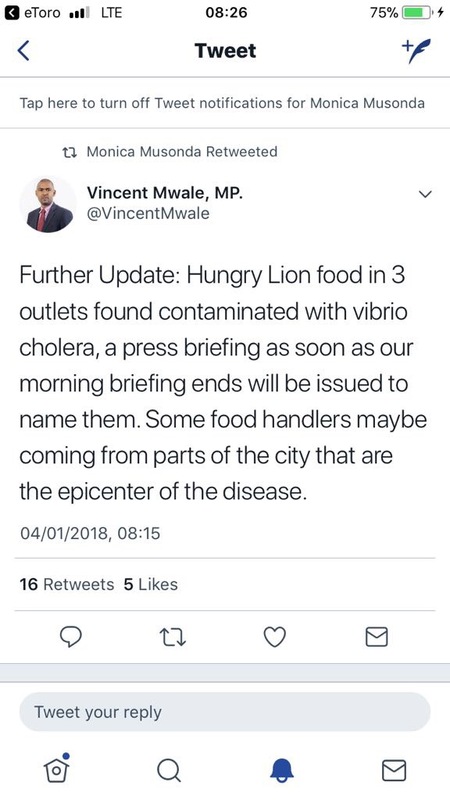 Minister Vincent Mwale says cholera cases are in the increase and that almost all Hungry Lion outlets have cholera contaminated food. We note with deep sadness the now perennial cholera disease outbreak which has so far led to the loss of close to 50 lives in our country. 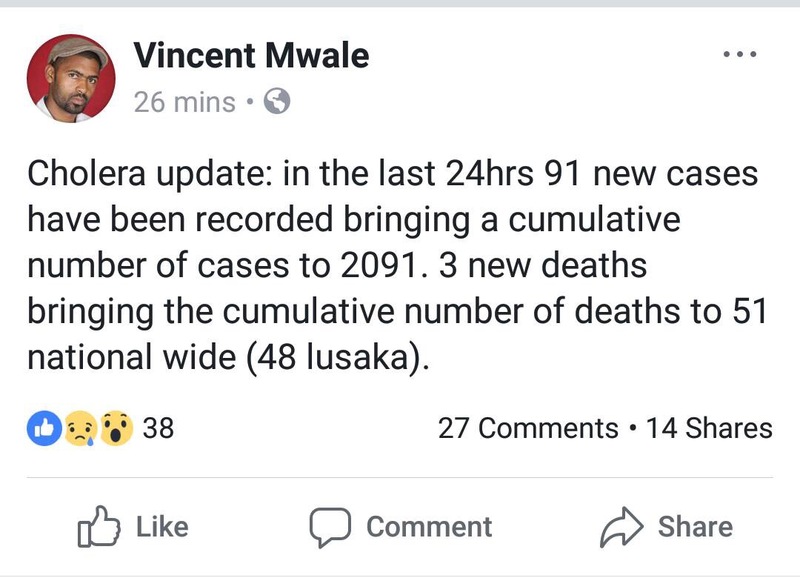 In September last year, we warned the nation, especially our colleagues in the PF leadership, on the need for robust measures and preparedness for the anticipated rise in cholera cases. Back then a few cases had already been recorded in some of our high density areas such as Kanyama Compound. We even obeyed the health professionals’ warning not to hold our planned political gatherings in form rallies as a means to save lives. The government’s late, inadequate and slow response has led to a panic situation where cholera cases have increased rapidly, resulting in the avoidable deaths of our citizens. We convey our deepest condolences to the bereaved families who have lost their loved ones while wishing those affected a quick recovery. We also fully sympathise with majority of our citizens who have abruptly been made to vacate their trading places without being given alternative sites with suitable hygienic conditions for them to earn a living in these harsh economic conditions. The entire nation has now been affected by the deadly epidemic which has now forced the closures of schools nationwide. This is not the time for politicking. We once more call on all our citizens, regardless of our political affiliations, to take responsibility to help in combating this epidemic and save lives. This will be tough for all of us and will affect our livelihoods, but we must eradicate this disease at all costs. To those in charge of managing the affairs of this country, it calls for deep reflection on their part in terms of priorities in the application of our meager resources for our people and timely decision making. Was it really prudent to corruptly acquire 42 fire engines at US $1 million each when documentary evidence shows these are just basic machines that can be bought at US $ 250,000 each? We could have saved a huge chunk of money that is desperately needed in public health and education. Our citizens must always connect the inherent corruption of our PF colleagues, which is even being admitted by fellow senior PF leadership colleagues, to how it affects our everyday lives. To our brave armed forces who are working tirelessly in some unbelievably challenging conditions, we would like to say ‘thank you’. Please know that we are very proud of you. We urge everyone to heed the advice of health professionals. Let’s endeavour to keep our surroundings clean, avoid unnecessary travels and contacts, and ensure we rush any suspected cholera cases to the nearest centres on time.